From Cherry Blossom Way into Cherry Blossom Village via CLubhouse Dr. Once passed Clubhouse,turn left on Loch Lomond,house halfway down on right. The best new build in Cherry Blossom is finished & ready for new owners! 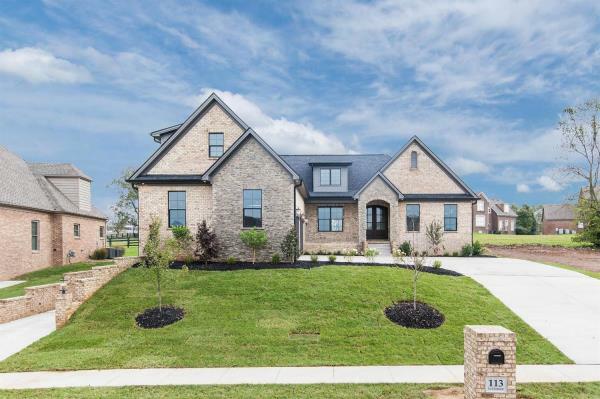 Southern Luxury Homes is proud to present this beautifully crafted home located in Georgetown Ky. One step into this home will make you fall in love. With a grand open floor plan, gourmet kitchen, reclaimed materials, private master suite, HUGE basement, scenic back drop, there is so much to offer. Located close to Toyota Motor Manufacturing Ky (TMMK), with easy access to I-75, it is approximately an hour to Cincinnati & 20 minutes to downtown Lexington. Georgetown is a growing community that boasts small town charm. Cherry Blossom Village gives you an opportunity to be close to everything, yet secluded & surrounded by other great homes & Cherry Blossom Golf Club. Come see the attention to detail that Southern Luxury Homes brings to the neighborhood! Buyer has option to leave basement unfinished in as-is condition for $25, 000 credit back on listing price. Contact agent for basement finish details.